We did the drawing for the Mini Cooper S on Wednesday, December 29. We still had people buying tickets up until the very last minute. We sold a total of 174 tickets and raised just under $9,000. With that money, we can neuter almost 350 male cats and spay nearly 220 female cats (or some combination of the two). We sold tickets across Ohio and even out of the state. Joe helped me do the drawing by holding the video camera and speaking. 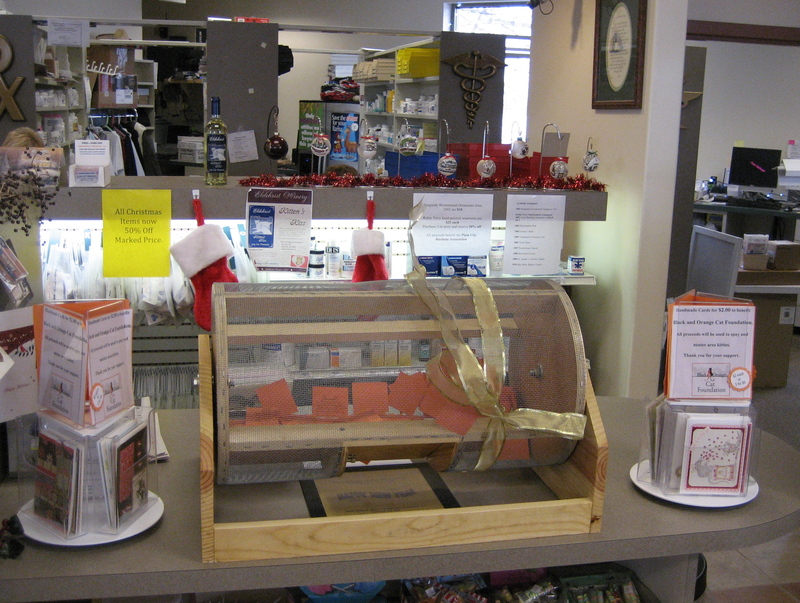 We decided that we would pick a random customer who came in Plain City Druggist to draw the ticket. We waited in agony for 10 minutes for someone to arrive so we could nab them for our job. Thank you to Betty Williamson for so graciously allowing us to videotape her and for choosing the raffle ticket. We also want to thank Roger Weeks for allowing us to use his ticket drum. The winning ticket belonged to Vivian Opelt, who is a wonderful supporter of Black and Orange. Vivian also works on her own to spay and neuter stray cats and adopt them to families. We’ve been working with Vivian for several years, posting cats for her and helping each other find homes for our kitties. Vivian was on vacation this week from her job at Wendy’s, so it took me a bit to finally track her down. When I finally did, she thought I was calling about a lead on a home for two of her kittens, Mickey and Tony (you can see their cute faces on our Petfinder site: www.bandocats.petfinder.com). You can watch the entire video of the raffle drawing (just a little over two minutes) on the Black and Orange Facebook page HERE. It’s not too exciting, but we wanted proof that the drawing was legitimate. I, however, am a bit too excited about Vivian’s name being drawn and exclaim, “I know Vivian!” As if I didn’t know almost everyone who entered the drawing. Vivian was truly a deserving winner and we thank her for all that she has done to support us. I also want to thank everyone who entered the raffle. I felt a bit sad to see the contest end, because so many people hoped the Mini would be theirs. I’m sorry not everyone could win! I also want to thank Ernie Sparks of Ernie’s Medicine Shoppe (formerly London Apothecary) for donating the car and helping us raise so much money to spay and neuter area cats. 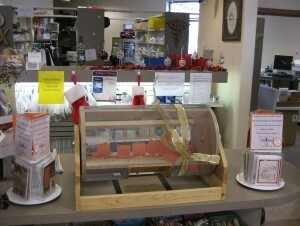 We all had a ton of fun with this raffle. 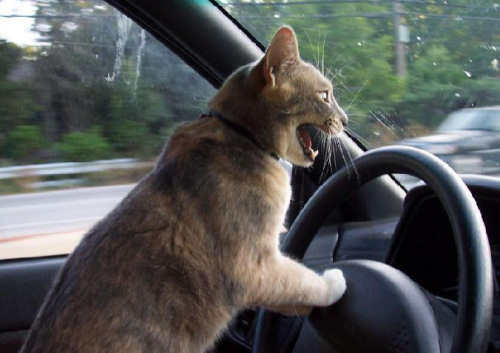 Thank you again for helping us be “Mini, but Mighty.” And we hope that Vivian’s cats will not be allowed to drive the Mini unless in a complete emergency. A Few Updates for the New Year. The little fairy featured here was a gift from my parents. 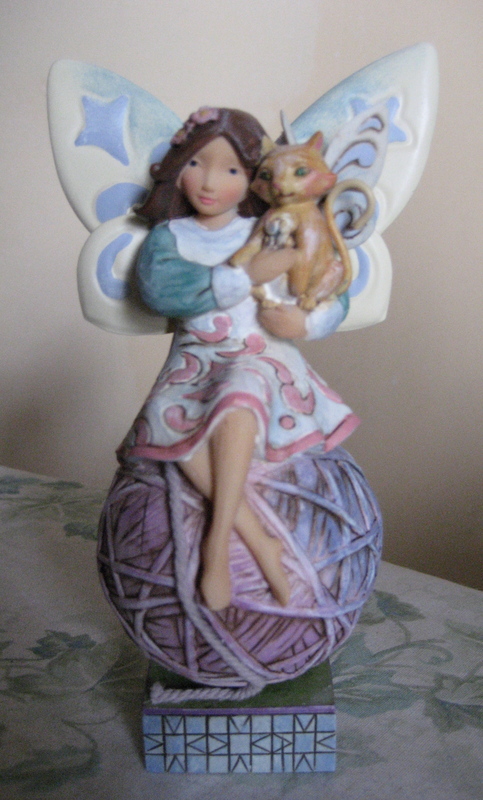 It is a “Feline Fairy” by artist Jim Shore from his Heartwood Creek collection. My dad picked this particular sculpture, because the fairy had brown hair like me and the cat resembled my orange chubster, Oswald. This lovely little ornament reminded me of all the wonderful people who have helped me and Black and Orange Cat Foundation over the past year; who have been our “fairies,” our protectors. I hope that lots of fairies and angels will be watching over all our kitties in 2011, as well. Besides thanking everyone for their support in 2010, I also wanted to take this time to update everyone on some important animal issues for the coming New Year. First of all, we have sold (at this writing) almost 180 of the Mini Cooper raffle tickets. While we did not reach our goal of 200 tickets sold, we came pretty close. The drawing will be held tomorrow, December 29, and we’ll post the winner, as well as a video of the drawing, first thing in the morning. I want to thank everyone who supported us by buying a ticket. Even if everyone cannot win the car, you are all still winners for B and O.
Secondly, as many of you know from reading the blog over the past year, there was a giant campaign by the group, Ohio Voters Against Puppy Mills and Dog Auctions, to get 120,700 signatures from Ohio residents to put an initiative on the ballot for 2011 to ban dog auctions in Ohio. Those signatures had to be collected by the beginning of December and, unfortunately, only 77,355 signatures were collected. However, even though they did not get the required signatures, the group plans to begin “Phase 2” and continue collecting signatures in 2011. All of the 77,355 signatures previously collected are valid and can still be applied toward the 120,700 needed. To find out more and begin collecting signatures, go to the Ban Ohio Dog Auctions web site. While the lack of signatures in 2010 was a slight setback, we know that eventually this group will prevail and dog auctions in Ohio will end. On a happy note, BarkPark is returning in 2011! Hurrah! Many of you know that BarkPark, the wonderful dog park that raised money for animal groups in central Ohio, closed over the past year. 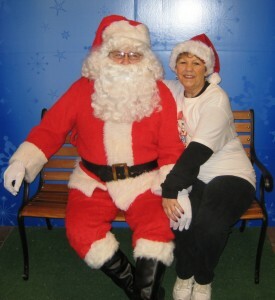 In a newsletter from BarkPark founder, Marcia Perry, it was noted that the 2011 season will start on May 28. BarkPark will not be open every Saturday as it was in the past, but rather once per month through October. To find out more and get your membership for the upcoming season, visit the BarkPark web site HERE. 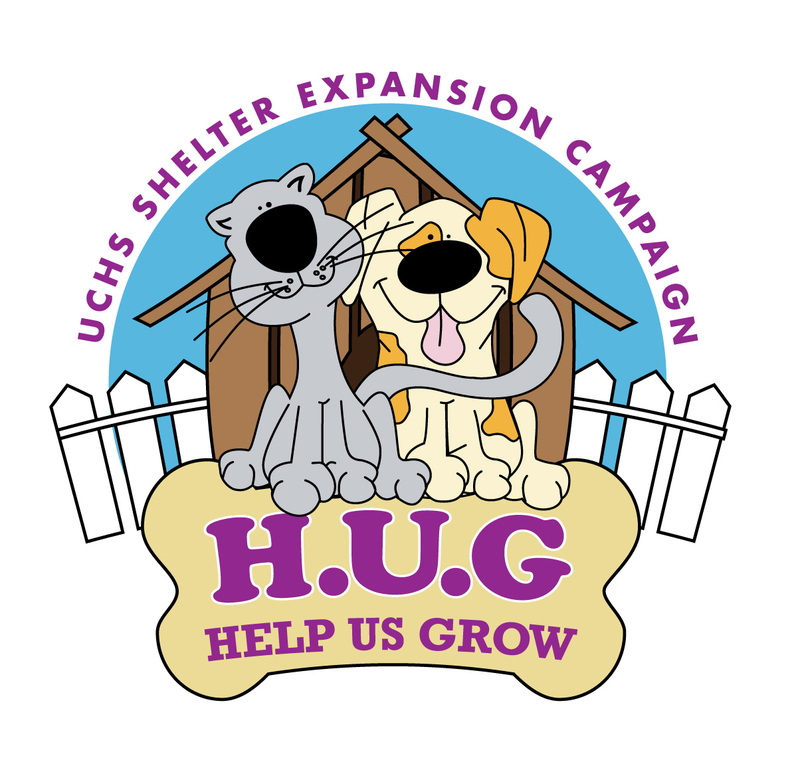 And finally, there is more good news with the Union County Humane Society’s “Help Us Grow” or “H.U.G.” campaign. The shelter in Marysville hopes to double in size, but they need help to raise the $400,000 they will need to grow. As many of you know, Black and Orange works with the Union County Humane Society (UCHS) with weekly clinics for stray and feral cats. Our hope is to eventually decrease the number of unwanted cats in our area. 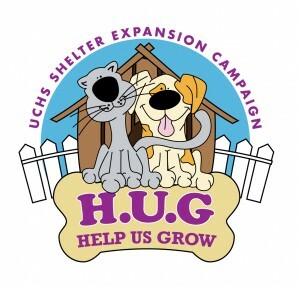 UCHS is a super humane society that places 85-90% of the animals they take in. By expanding, they will be able to help even more animals in need. To read about the H.U.G. campaign and make a donation, please visit their newly update and classy web site HERE. Union County’s H.U.G. Campaign was even featured in a nice article in The Columbus Dispatch on Monday, December 27. You can read that article HERE. As we enter 2011, I promise to try to keep everyone updated on issues that effect Black and Orange and animal lovers throughout Ohio and the “blogosphere.” I’ll do it with the help of all our supporters and our “feline fairies” everywhere. Good-bye to Leo Albert Blain. The LAB has Moved On, but Remains in Our Hearts. Leo Albert came in to our lives back in February with the cold and snow. I first reported on him and another “Miracle kitty” at the beginning of March in a blog posting (you can read his story HERE). 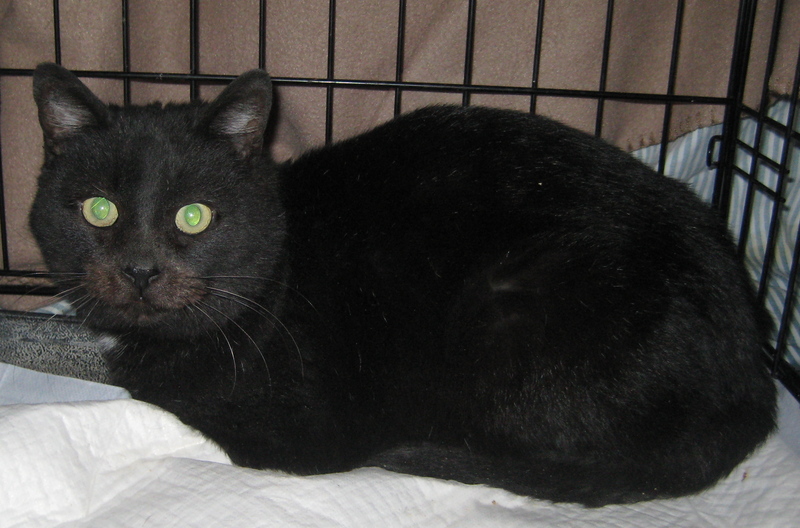 Because this sweet little guy was feline leukemia positive, we had nowhere to put him with our other negative kitties. Feline leukemia is easier to transmit between cats than FIV. I put the word out that we needed a foster home without other cats or with dogs. No takers. Then on one of my PetSmart cleaning days, I happened to be talking about Leo Albert (who was just Albert at that time) to our good friend Brian as he checked me out. Brian made a passing comment that didn’t hit me until later. He said, “I don’t have any other cats.” When I finally realized what Brian’s words meant, I sent him a message to see if he was saying what I thought he was saying. Yes, he would be willing to foster Albert (a foster stint that eventually turned into an adoption). Shortly after Brian’s birthday at the beginning of March, Bobbie and I took Leo Albert to his new home. You can re-read that story HERE. Brian and his mom had always had cats, but it had been a little while since their last one had passed on. Carol and I routinely bugged Brian about adopting from us, but until Albert, Brian had always waved our suggestions away. Leo Albert became the king of the household. Brian was always regaling us with stories of his antics and showing us photos on his phone. If you happen to be friends with Brian on Facebook, you will see that he has one whole photo album of pictures of the LAB (Leo Albert Blain). But Leo Albert’s happiness was to be short lived. On November 26, I had a text from Brian that he had to take Leo Albert to see Dr. West because he was not eating. Dr. West was running tests and discovered that his white blood cell count was up. In fact, Dr. West told me that she didn’t know how Leo survived as long as he did with those white blood cell numbers. I know how he survived. Brian kept him alive. He gave him his antibiotics faithfully. To get him to eat, Brian bought small pouches of the most expensive soft cat food PetSmart carried and took it home and chopped it up in a blender. He then fed Leo Albert a tasty gruel in small bites until he had eaten most of the concoction. Leo Albert continued to get better with Brian’s loving care. At the beginning of December, Leo Albert started having trouble walking and he began to spend a lot of time lying in his litter pan. He was still eating and Brian was cleaning him up every day and night, because he was having accidents that made a mess of his backside. Leo Albert was on a downward spiral that Brian could not stop. 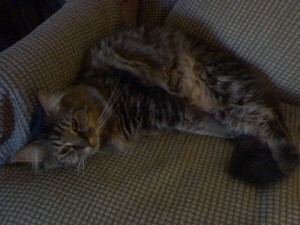 Leo Albert had lost the ability to use his back legs and his bladder was also blocked. We are not sure if he had some type of nerve damage due to the feline leukemia or what exactly was causing the problem. But Brian did not want him to suffer any longer. Today Brian brought Leo home. He made him a small coffin and plans to bury him in the spring behind the house. Leo Albert was only a little over a year old. He spent nine happy months with Brian and Brian’s mom. I could not ask for a better life for our little guy. He got to experience love, a home, and the joy of being a wanted cat–things he would never have had without Brian. Thank you, Brian for making one of our kitties your own. A few weeks before Thanksgiving, Kim and Paul Swider (Naomi’s former foster parents) told me they had seen a cat get dumped and then hit on the road in front of their house. They chased after the cat who was severely injured, dragging it’s body by it’s front legs because it’s back legs were not working. But try as they might, the cat, even on only two legs, would not let them near it. I told them if they could catch the cat to bring it to me any time so I could get it in for medical help or euthanasia depending on how bad it’s injuries were. The next week Kim and Paul reported more sightings of the cat–it was still dragging itself around. Paul had made sure to put food out for it, but even when the cat pulled it’s body on to the porch to eat, Paul could not grab it. Finally, the Monday before Thanksgiving, Paul was able to trap the all black cat, who they named Biscuit, and bring him to me. I quickly took him to Noah’s Ark thinking they might have to euthanize the poor cat. But when Dr. Jensen let Biscuit out of the trap he was in, he was no longer pulling himself on two legs. Rather, he was walking on all four, but with a slight limp. Biscuit was also not a feral cat, as I had feared. 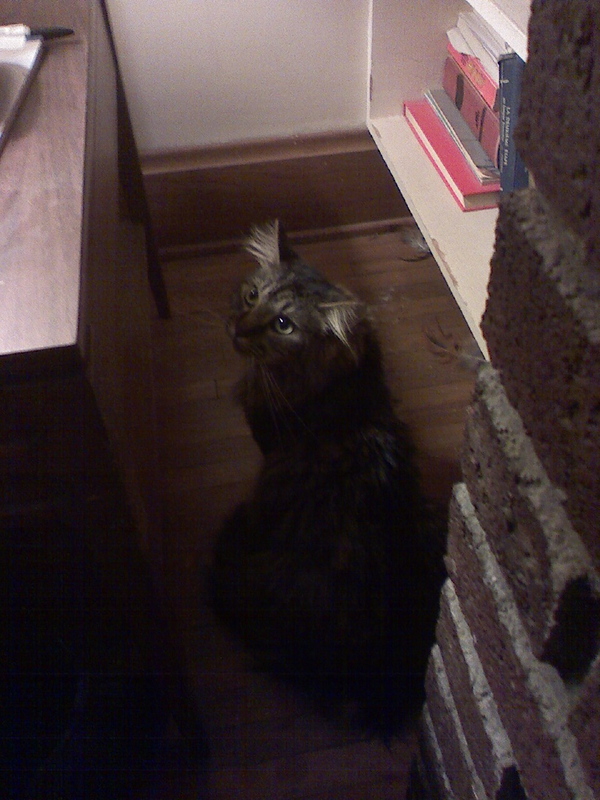 I worried about putting a cat who had experienced such trauma back outside to take care of itself. Biscuit, however, was very friendly. He must have been someone’s cat–maybe even the people who tossed him from the car. From the X-rays, we discovered that Biscuit had not just been hit by a car, he had actually been run over by the car. Yes, run over by an enormous vehicle, tires smashing bone. His pelvis had been broken in five to six places. The good news, however, was that in those weeks when he could not walk and pulled himself around, the bones had mended and he was healing. He would not need surgery. Only further cage rest to allow his pelvis to completely mend. I was amazed. Here was this cat who had been run over by a car and he was going to be okay. His bladder and bowels were working fine. Although he was pretty thin (he did have pebbles in his stomach from trying to find something to eat), he would recover. 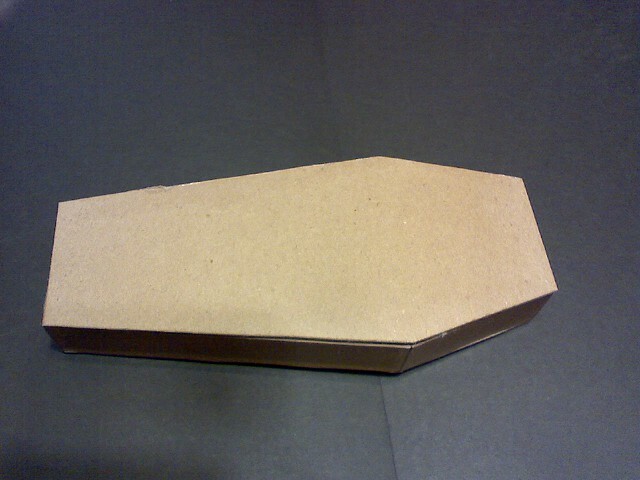 He did have a little bit of a limp, but even that has almost vanished now. Dr. West says that cats are truly the ultimate survivors. She thinks that if anything ever happens that wipes out the rest of the planet, cats will still be here, the only species that will have lived through whatever killed the rest of us. Because Biscuit needed more weeks of rest, he went to stay at the shop with Carol where he would be the only cat in residence. Dr. West didn’t want to neuter him until his pelvis had healed more and we were not sure how our other cats would take the smell of an un-neutered male cat’s urine. So to the shop he went, where he quickly proved how resilient he was. Carol placed Biscuit in Alex’s bathroom at the shop. Alex was now at PetSmart waiting adoption, so his room was free. Alex had spent many weeks in that bathroom with no problems. The very first night Biscuit was in the bathroom, he figured out how to pull a panel off the wall, climb through a hole, and escape out in to the shop. Carol spent four days looking for him with no luck. 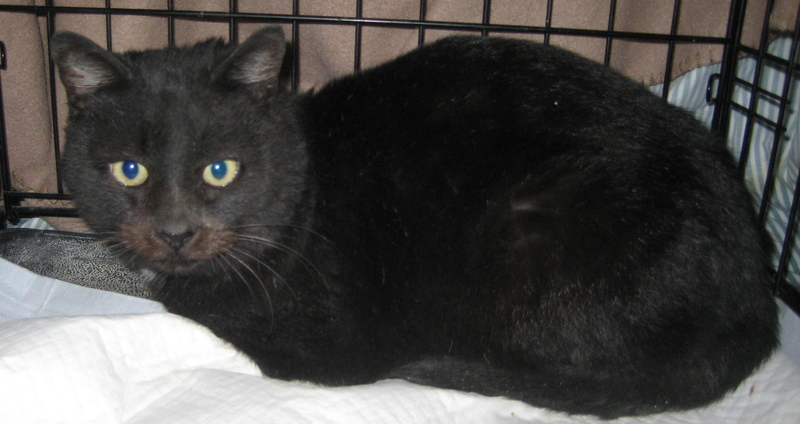 Only a trap and some smelly soft food retrieved our “Houdini” who then went into a dog crate to prevent further escapes. Angry at his forced imprisonment, he trashed every cage Carol placed him in. We know Biscuit must have been someone’s cat. Not only is he friendly, but he also can use his paws to open doors. The very first moment after we put him in Carol’s bathroom at the shop, he reached out his paw and tugged at the door. The ladies at Noah’s Ark also told me he had tried repeatedly to break free from his room. 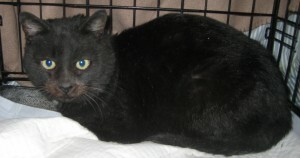 Biscuit is now almost completely healed and will soon be looking for a new home. He may always walk a little funny with a tiny limp (but even that has almost disappeared). He will probably always be too smart for his own good. And he will definitely always be a survivor. But our little survivor also needs to be something else–wanted. We hope to find him a forever home very, very soon. Santa Claws (our own Chuck Gaul) is Coming to PetSmart on Saturday, December 11! We hope you’ll come out and see our very own “Santa Claws” on Saturday, December 11 at the PetSmart located at 6010 Sawmill Road in Dublin (next to the Target store). Once again, our favorite Santa, Chuck Gaul, will be donning his red suit and fluffing his beard to have his picture taken with all the happy pets in the central Ohio area. You can get in the photo, too, if you’d like! We will be taking photos between 11 am and 4 pm. The pictures are $9.95 with a PetSmart PetPerks card. You will receive one 4×6 digital photo in a holiday collector frame. Five dollars from every package purchased will go directly to Black and Orange! If you’ve adopted a cat or kitten from Black and Orange, we’d love to have you bring them out for the photos so we could see them again. One of our very favorite things is seeing all of our former kitties with their new families. We want to thank Chuck Gaul for doing such an awesome job as our Santa. This has been a really rough year for Chuck and Carol and we feel very blessed to have our Santa and Mrs. Claus in our lives.